If you have a family and need four bedrooms, you will almost certainly have to pay a premium for a garden and extra living space. Whilst, if you’re searching for a one bedroom flat close to central London and your budget is only £1,000 /month, then you may need to widen your geographical search! As with life, searching for a rental property may include having to make compromises. 2. What do you actually need? If you’re living alone, or you have a large family with kids and a dog, your needs will be different. Your choice of rental property needs to complement your lifestyle. Draw up a list of the most important aspects you are looking for and be aware that you might not find exactly what you’re looking for. Make sure you are clear about your priorities. A second bedroom might be useful, but would you actually prefer a garden? The old adage 'location, location' is equally true when renting a property. You may have your heart set on a specific area because you know it well or because you have friends or family nearby, but it’s always worth keeping an open mind and letting your budget drive your search. If your monthly budget only allows you to rent a one bedroom flat in area of choice, you might want to consider a two bedroom apartment slightly out of area. Especially if it affords you more space and saves you money. 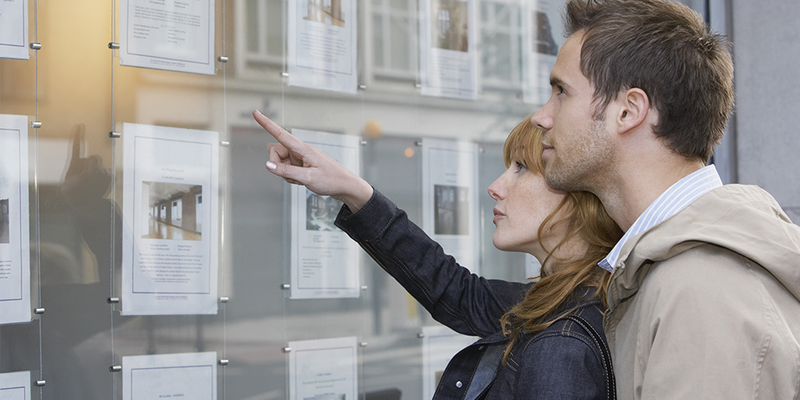 Online portal such as Rightmove and Zoopla are a great way to start your property search. However, be aware that some properties are rented out before they even get listed online, so it’s worth registering with a local estate agent who will help you find properties as soon as they become available. Unless you are very confident that your first property viewing is 'the one', it's worth viewing several properties so that you get a feel for what's available. Be realistic in your search. The prefect property may not exist. When you have a clearer view about what you want and you find one that 'nearly perfect', don't umm and ah! Rental markets can often be competitive and chances are the property is already being eyed up by someone else. When you’ve found a property you are happy with, put your offer into the agent straightaway. You might get away with an offer that’s lower than the asking price but be prepared to go higher, especially if you are up against other offers. To maximise your chances of getting the property, we'd recommend making an offer as close as possible to the asking price. If you're in a competitive bid, be creative about your offer. You could offer the asking price with an extended term for example. This might be more attractive to the landlord than a slightly higher offer for the minimum term. The date you can move in may also affect the chance of your offer being accepted, as no landlord wants a property to be empty for a couple of months after it first becomes available. Agreeing to the lease from day 1, might put you in a better position than another prospective tenant, even if that means an overlap with your current accommodation. Don't forget, when you're negotiating with the agent, now is the time to make any requests to the landlord about anything you would like to change. The documentation will need to be approved by the landlord. Whilst the paperwork is being prepared you will need to pay your deposit and the first month’s rent. You will also need to sign the tenancy agreement, which is the contract in which you formally agree to rent the property. Your landlord will also sign the tenancy agreement and, at this time you should also raise any questions or concerns you may have. Future rent collections will probably be by standing order, so that may need setting up too. When the paperwork is in place and your deposits have been paid, it’s finally time to move in! The keys for your new rental home will be available on the day your tenancy starts, so you'll need to plan removal companies / other modes of transport around when you’re able to collect the keys from your estate agent. An inventory will also be prepared for your new property, possibly on the day you move in. It's a good idea to request a copy. In addition, we'd recommend that you take your own notes / photographs, detailing the condition of the property on the first day. If there's anything that has the potential to cause a dispute in the future take a photograph of it and ask the agent / landlord to put it right. Once you've moved in, relax! Congratulations and enjoy your new home!